This album features a collection of hymns performed on solo piano by acclaimed pianist Rebecca Pacheco. 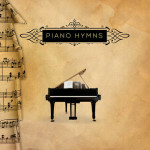 These hymns are classic melodies that evoke a spirit of calm, peace, and reverence. On each track you’ll find highly trained classical piano technique and a very musical approach to these arrangements, breathing new life into some of the most beloved hymns.